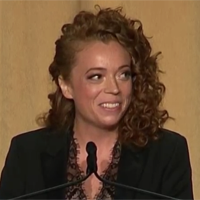 Showing 1 - 15 of 38 articles tagged "White House Correspondents’ Dinner"
Michelle Wolf fires back at President Trump after he called her a "so-called comedian"
Wolf also defended her right to make jokes about whatever she wants, in her opening monologue. At the White House Correspondents' Dinner, Wolf compared the White House press secretary to Aunt Lydia. “It went great and every single person loved it,” Wolf joked to former boss Seth Meyers.